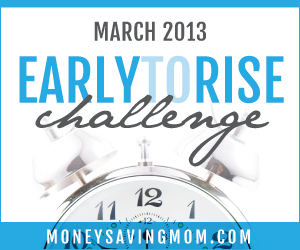 This is Day 13 of the Money Saving Mom Early to Rise Challenge! I have to admit I'm struggling with this challenge a bit more than I'd like to admit. I know it's expected, since it is a Challenge after all. I really feel like I need to get my act together and be more motivated to get up every morning. I don't seem to have a problem waking up, but physically getting up out of bed. Is anyone else having or had the same problem? So, I ended up waking up at 5:30, but I didn't get up and get downstairs until 5:47. Almost 20 minutes later! I think I need to go back and review the first few days to get my motivation back. Maybe having coffee ready for me in the morning will help. Today's passage covered how to be a blessing to others. In fact the book's assignment was about tangible things we could do to bless. I didn't make it through the assignment. It was a lot harder than I thought. I'll pick it up again over the next few days until I get it done. Hopefully I'll incorporate some of these things soon.